The EZ Load Quilt Display is the most recent original design from DWR Custom Woodworking. 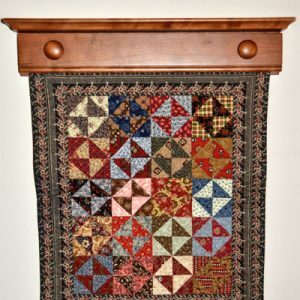 The design allows the quilt to be changed without removing the entire hanger from the wall, making it ideal for larger wall hanging quilts. Only the quilt holder is removed to change the quilt. 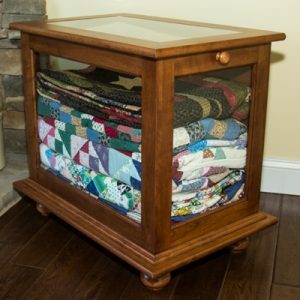 The quilt is placed into the holder while on the floor, table or other flat surface and then the holder is reinserted into the wall mounted enclosure. Covers are then placed to give the Quilt Display a beautiful finished look. The quilt remains supported across the entire length of the quilt and prevents the stress points associated with quilt clips, pins, and other hangers that support quilts at 3 or 4 locations. The EZ Load Quilt Display is available in Oak, Maple, Cherry, Mahogany and Walnut. The 3 styles available are the Mantle, Beaded Board and Traditional. Pricing and photos follow on the next pages. The mounting board is supplied without drilled mounting holes and are placed to match the stud locations where the EZ Load Quilt Display will be installed. The EZ Load Quilt Display MUST be mounted into studs. 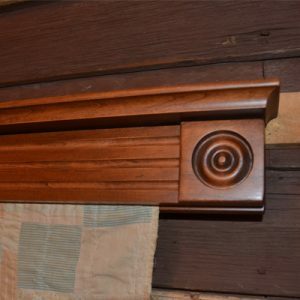 The Mantle style has a 5 1/2” shelf. 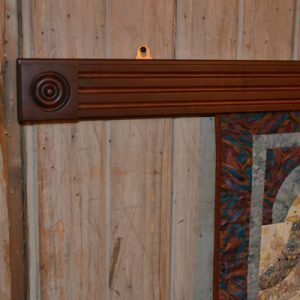 Add 5 1/2” to the ordered quilt hanger length to determine the space required for the overall length of the shelf when installed on the wall. The shelf has a plate groove milled 1 3/4” from the back of the shelf.